World Centric 2oz PLA Parfait Cup Insert for 9oz tall cold cup. Not sure which Cup it fits? Click Here. 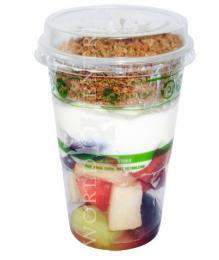 World Centric is excited to present our new 2 oz parfait insert cup (SKU#CPL-CS-2P) to be used in conjunction with our tall 9 oz cup (SKU# CP-CS-9) and the corresponding lid for the 9 oz cup (SKU# CPL-CS-9). These items when used in conjuction are ideal for yogurt parfaits and other items requiring compartmentalization. All three items are sold separately below.